The narrative begins with the birth of a beautiful Chanda to King Sahadeva of Govar. While still very young, she is bound in wedlock to a blind and impotent Prince. The great beauty that brought her this lamentable fate also releases her from it, for the unhappy maiden catches the eye of a wandering ascetic, Bajir. Bajir sings her praises wherever he goes and sets the story in motion. His songs arouse the lust of King Rupchand so much so that he forcefully tries to forge an alliance with King Sahadev. This is when our hero, Laur is brought in by the King, to overcome and kill Rupchand; but he falls in love with Chanda, though not before achieving his goal. Chanda engages her confidante, Brihaspati in arranging secret meetings with Laur. But the story isn’t as simple because Laur is married to Maina – who comes to know about her husband’s illicit love and devises ways of winning him back when he elopes with Chanda. Chanda and Laur’s elopement itself is ridden with challenges – snakebites, thieves and the King Mahipat – who invites Laur to a game of dice and wins everything including Chanda. He is, however, outwitted by Chanda and they journey on. Maina on the other hand, entrusts Sirjan, a caravan leader with the task of locating her husband. Eventually, Laur and Chanda return but the lovers’ plight does not end with confrontation and Chanda ends up as Laur’s second wife. 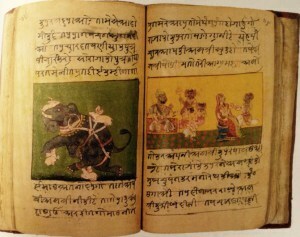 The folios of Laur-Chanda are rare and significant in artistic terms. 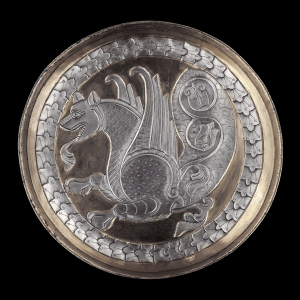 A set of 24 folios has survived, of which 14 lie with the Lahore Museum in Pakistan, and 10 in India’s Chandigarh Museum. The poem by Maulana Daud testifies to his genius as a great storyteller. The artist pays tribute to this very genius by placing him in every folio – almost reminding the viewer of the origins of the story. You will notice him in white with a holy book in every frame. A long tradition of preparing princes to rule was the genre of literature known as ‘mirror for princes,’ fables with tales in which animals are the leading characters of the stories. These tales, thought to have been introduced to the Muslim world through India, were derived from the Indian Panchatantra (‘The Five Principles’) and Mahabharata written in Sanskrit around the year 200. 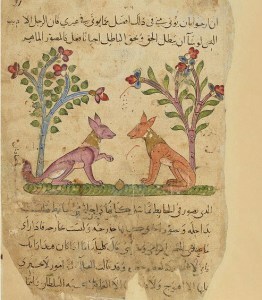 The tales were adapted and translated into numerous languages including Persian and Arabic, and were illustrated in Kalila wa Dimna manuscripts – from the thirteenth century onward in Arab lands, and from the fourteenth century in Iran.